Homecoming Vets at the Crossroads of Humanity | Information network for Canada's vets and their familes. A “Veteran” – whether active duty, discharged, retired, or reserve – is someone who, at one time, wrote a blank check made payable to Canada, for an amount “up to and including” his or her own life. Information network for Canada's vets and their familes. A “Veteran” – whether active duty, discharged, retired, or reserve – is someone who, at one time, wrote a blank check made payable to Canada, for an amount “up to and including” his or her own life. Our Duty to Veterans PETITION — please sign immediately! The Mefloquine Controversy: Is this anti-malaria drug dangerous to your health long-term? True. That’s their first reaction. It lasts until the welcome home hug and the long breathless embrace. It’s afterward, when you each pull back and look into the other’s eyes. That’s when you lose each other. Let’s say you’re his Dad. When this vet left for war, he was still your boy, full of fun and pranks. Life was an open invitation to adventure. Anything was possible. That’s the image locked in your mind since he left. Your response now to this vet is to that image. But that’s not the image before you. His eyes tell you how much he has changed. Their twinkle is gone. His gaze is unwavering, but deep beneath its open appraisal dwells hurt, pain and confusion, and a longing for returned innocence. After months at war, your boy has grown older than you. He’s lived with death chasing him, usually on the roadside or on the path of a local village. How many improvised explosive devices have killed his buddies? Those buddies became closer to him than you, his Dad. He’s happy to see you, but his heart yearns for those left behind, for the adrenalin rush, for the heart-pounding fear, for the ecstasy of mutual relief when they beat death together one more time. Even what he smells has changed. Every new scent is tainted with his memory of reeking cordite, burnt flesh, gas fumes, and the stench of spewed guts. For that moment, he’s vulnerable. He lets you see into him, and then the impact of seeing you again strikes him. He sees how you’ve changed, and aged, worrying about him. He mentally pulls a mask over his need for comfort to protect you from all that he has seen and what he has become. To defend and protect. Who better than the ones he loves? And the estranged tap dancing around each other begins. UK DEFENCE SELECT COMMITTEE LARIAM INQUIRY – AN APOLOGY FROM THE MINISTER!! I just received this letter from Trixie Foster in the United Kingdom. Thought you may like to see this. I was one of the witnesses for the Inquiry on 8th December and Remington Nevin flew over for the day to give evidence. On 12 January they questioned the Surgeon General, his advisers and the Minister of Defence Personnel & Veterans. We got an apology for all those who were given Lariam without an individual risk assessment. Here are the links – The British Broadcasting Service News programme did quarter of an hour on it last Tueasday so on the link click on 12 Jan Tuesday news. I have attached the transcript in case you do not wish to watch it on the Defence Select Committee website. There are also many submissions that we wrote to get the Inquiry. 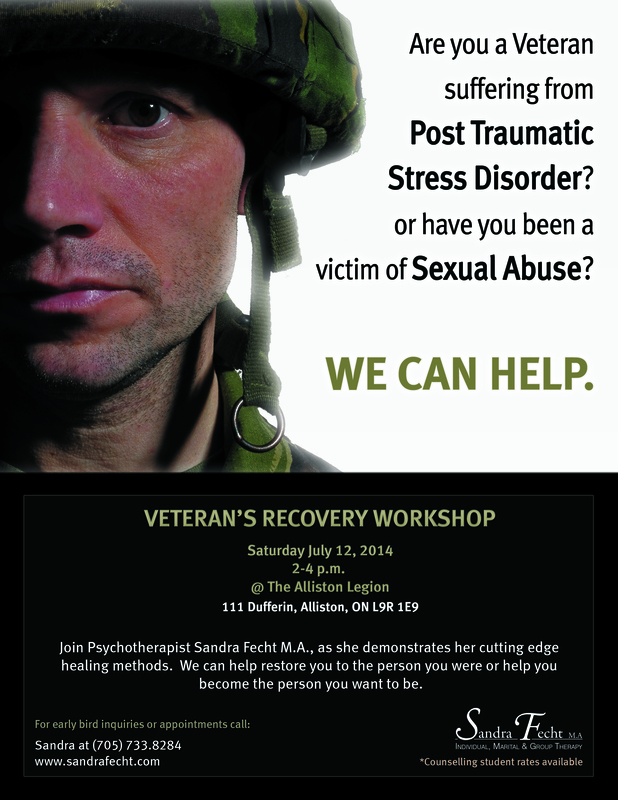 I do hope this will help all the Canadian Veterans. You can also see Remington Nevin’s Twitter which is on top of things too. Australian Veterans are also asking for an Inquiry. Missing 2004 IL10-2004-007 Recovered — Details Long-Term Health Effects from Malarial Mefloquine Drug — Also Roche Report from Australia Lists Disabling Toxic Effects. A soldier’s struggle with neuro-toxic brain injury. Mefloquine is an odourless, bitter-tasting, white crystalline powder. It is soluble in methanol and ethanol but practically insoluble in water. A 1% aqueous suspension has a pH of 5.6. LARIAM tablets are cylindrical biplanar, white to off-white, cross-scored with break bars on both faces and marked with “RO”, “C”, “HE” and an imprinted hexagon in the quadrants of one face. They contain 250 mg mefloquine in the form of mefloquine hydrochloride (274.09 mg). LARIAM tablets also contain the following excipients: poloxamer 3800, microcrystalline cellulose, lactose, maize starch, crospovidone, ammonium calcium alginate, talc and magnesium stearate. LARIAM (mefloquine) is an antimalarial belonging to the quinoline-methanol group of medicines and is structurally related to quinine. #Mean duration of treatment ± SD was 28 ± 8 days for atovaquone-proguanil and 53 ± 16 days for Lariam. In the table below, an overview of adverse reactions is presented, based on post marketing data. very common (>1/10), common (≥ 1/100 to < 1/10), uncommon (≥ 1/1,000 to < 1/100), rare (≥ 1/10,000 to < 1/1,000), very rare (<1/10,000), not known (cannot be estimated from available data). Due to the long half-life of LARIAM, adverse reactions to LARIAM may occur or persist up to several weeks after the last dose. In a small number of patients it has been reported that dizziness or vertigo and loss of balance may continue for months after discontinuation of the medicine. There have been rare reports of suicidal ideations. No relationship to drug administration has been established. (i) Non-immune patients recently arrived from endemic areas. A loading dose of 3 tablets (750 mg), followed 6 to 8 hours later by 2 tablets (500 mg). For patients in malaria endemic areas, a smaller total dosage of LARIAM – 750 to 1,000 mg – is sufficient since they have usually developed partial immunity. Adults weighing 60 kg receive an initial dose of 3 tablets, followed by 1 tablet 6 to 8 hours later. If a full treatment course has been administered without clinical cure, alternative treatments should be given. Similarly if previous prophylaxis with LARIAM has failed, LARIAM should not be used for curative treatment. Prophylaxis of malaria with LARIAM should be initiated 1 week before arrival in a malarious area. LARIAM can be used for up to 3 months in the prophylaxis of malaria. Stated dose to be given once weekly, always on the same day. First dose one week before departure. Further doses at weekly intervals during travel in malarious areas and for 2 weeks after leaving the area. The tablets should be swallowed whole with plenty of liquid. LARIAM can be given for severe acute malaria after an initial course of intravenous quinine lasting at least 2 – 3 days. Interactions leading to adverse events can largely be prevented by allowing an interval of at least 12 hours after the last dose of quinine. In cases of overdosage with LARIAM, the symptoms mentioned under ADVERSE EFFECTS may be more pronounced. Contact the Poisons Information Centre on 13 11 26 for advice on management of overdosage. Packs of 8 tablets (cross-scored) each containing 250 mg mefloquine. Store below 30 °C. Store in original container. Protect from moisture. The release of medicines into the environment should be minimised. Medicines should not be disposed of via wastewater and disposal through household waste should be avoided. Unused or expired medicine should be returned to a pharmacy for disposal. As more and more people are growing alarmed, we’re also seeing increasing advocacy for those suffering long-term from the toxic effects of mefloquine or Lariam as the preferred anti-malaria drug used by our military for more than 25 years. What a relief! Many of us have felt like lone voices in a desert for more than 20 of those years. The following report comes from testimony submitted to the Joint Veterans’ Affairs Committee Hearing on Veteran Service Organizations’ Legislative Priorities for the House and Senate Committees on Veterans Affairs in the U.S. by The Association of the United States Navy. At some point, our Canadian Military and Health Canada have to cave under such growing data and acknowledge what our veterans have suffered and endured since first introduced to this anti-malaria preventative treatment in Somalia and every overseas assignment since in areas where malaria occurs. “AUSN is concerned about the lasting effects on Veterans’ health from exposure to the controversial antimalarial drug mefloquine, which has been linked to a growing list of troubling psychiatric and neurological disorders. In Senate testimony in 2012, a former U.S. Army public health physician and epidemiologist [This was Dr. Remington Nevin.] cautioned that mefloquine could become the Agent Orange of this generation. In response to these concerns, AUSN and other organizations have been calling on the Department of Veterans Affairs (VA) to do more to educate Veterans to the dangers of mefloquine, to sponsor long-overdue research into the drug’s toxicity and to prepare its healthcare providers and disability evaluators to properly evaluate claims of long-term harm arising from Veterans’ exposure to the drug. Although there is a VA website, http://www.publichealth.va.gov/exposures/mefloquine-lariam.asp, this issue needs further study and analysis at the VA in order to evaluate such claims. “Previously sold in the U.S. under the trade name Lariam®, mefloquine was first synthesized in 1969 by scientists affiliated with the Walter Reed Army Institute of Research (WRAIR). Following a 20 year development effort, which culminated in the drug’s licensing in 1989 by the Food and Drug Administration (FDA), mefloquine quickly became the military’s “drug of choice” for the prevention of malaria, in part because its weekly dosing schedule simplified command-directed administration. Over the next quarter century, many hundreds of thousands of servicemembers were directed to take the drug, from operations in Somalia in the 1990s, to operations in Africa and Afghanistan as late as this year. “Since then, reports of mefloquine’s sometimes horrific side effects have become commonplace among Veterans, and reliable stories of Veterans suffering often debilitating injuries from the drug have been regularly featured in the media. Since 1989, even the drug manufacturer has warned that during use, if signs of unexplained anxiety, depression, restlessness or confusion are noticed, these could be considered an early warning sign of a more serious event from the drug. Yet, what this more serious event was has only became clear in July 2013, when the FDA added to the drug’s label a boxed warning, advising that mefloquine could cause serious psychiatric effects, including anxiety, paranoia, depression and hallucinations that could last years after use, and neurological effects including ringing of the ears, loss of balance and vertigo that could be permanent in some cases. This black box drug label also warns of a risk of suicidal thoughts and suicide. “Following the FDA’s boxed warning in the summer of 2013, Dr. Jonathan Woodson, the Assistant Secretary of Defense for Health Affairs, emphasized that mefloquine should only be used as a drug 7 of last resort to prevent malaria and called attention to data showing military prescriptions had fallen over 90% in previous years as the drug’s dangers became better known. To prevent malaria, the military now recommends the safer daily drugs Malarone® or doxycycline, the latter of which, ironically, was the military’s drug of choice over a quarter century ago before mefloquine was first introduced. AUSN notes that now that these safer daily drugs are once again used in place of mefloquine, malaria cases in the Department of Defense (DOD) are at their lowest level in a decade. Given that the safety and effectiveness of these daily drugs appears to be far superior to mefloquine, AUSN questions why mefloquine was ever used at all given its dangerous side effect profile, particularly over the past decade, during which time two safer daily alternatives have been available. For this reason, AUSN also supports legislation to remove mefloquine from the approved DOD formulary for non-emergency use and to fund the purchase of safer, and consequently more expensive, alternative anti-malarial drugs throughout the military medical services. Although curtailing new prescriptions of mefloquine is a necessary first step, this alone will do nothing to address the long-term harm that has already been suffered by prior generations of Veterans exposed to the drug. Scientists now recognize that mefloquine is neurotoxic and can cause permanent brain injury, resulting in a range of lasting psychiatric and neurological symptoms. According to the Centers for Disease Control (CDC), these symptoms may even confound, or complicate, the diagnosis and management of Traumatic Brain Injury and Post-Traumatic Stress Disorder. The U.S. Army Special Operations Command (USASOC), which recently banned mefloquine altogether, has even emphasized that some of the symptoms of mefloquine toxicity could be mistaken for malingering, or conversion, somatoform or personality disorders. “As stated before, for Veterans experiencing these symptoms, information available to those who were possibility exposed to mefloquine from the VA remains inadequate. VA websites still feature incorrect information on the drug’s side effects, fail to highlight the seriousness of FDA’s boxed warning and provide few resources directed specifically to help Veterans better understand their symptoms and seek appropriate care. VA must do more to reach out to affected Veterans with improved and more detailed and frank information. AUSN also calls upon the VA to sponsor long-overdue research to better understand the drug’s long-term effects and the burden of its toxicity among Veterans. VA should formalize the limited but ground-breaking clinical research into mefloquine toxicity, already being conducted by the War-Related Illness and Injury Study Center, and increase funding for extramural clinical and epidemiological research at civilian academic centers. “More must also be done to educate VA clinicians and disability evaluators to the effects of the drug. As early as 2004, the Veterans Health Administration (VHA) had issued an information letter (IL10-2004-007) to its clinicians warning of the possibility of long-term effects from mefloquine, but this letter was allowed to lapse and is now unavailable. AUSN calls on the VA to update this letter to reflect the latest research on mefloquine’s harmful effects, to disseminate its contents to its providers and to supplement this effort with conferences, lectures and continuing medical education (CME) as appropriate. With the FDA’s acknowledgement of the possibility of lasting side effects from the drug, the VA must also update its disability evaluation processes to recognize that certain long-term psychiatric and neurological effects may be the result of mefloquine exposure. As a 2012 memorandum by Dr. Woodson acknowledged, many military servicemembers were dispensed mefloquine without proper medical, the VA must develop procedures to adjudicate such claims, even in the absence of proof of prescribing. It is with special privilege that I repost a blog under A VETERAN’S VOICE by Wolf William Solkin found on Canadian Veterans’ Advocacy web site. Wolf is a World War II veteran, currently residing at St. Ann’s hospital in Montréal. He is encouraging Canadians to vote and has volunteered to write blogs for the Canadian Veterans Advocacy. It has indeed been the iconic Biblical “Threescore years and ten” since our generation of WW II Veterans finally forced the foes of our freedoms , the Nazis and the Fascists, to abandon their destructive and dastardly efforts to rule over us by dictatorship defeating democracy. At that time we were all so truly proud and happy that autocratic rule over most of the world was replaced by the democratic process, whereby we were primarily granted the (“God-given”?)) right to VOTE, to select and/or reject our nation’s leaders. There were, of course, many other precious rights and freedoms that we gained, but they could not have surfaced, let alone thrived, without our first having the cornerstone upon which they could be built…free and fair elections, whereby we could express our desires and demands for our preferred way of life by (s)electing those legislators whom we felt would best represent our best interests. However, and sad to say, as the years came and went, so too did our enthusiasm and interest for engaging ourselves and concerning ourselves with governing ourselves, wane and decrease to the point of diminishing (electoral) returns. To quote from a recent article written by Pete McMartin of the ‘Vancouver Sun’, …”In all,the adjusted turnout for the 2011 federal election was 58.5 per cent, second lowest in the country’s history…The largest voter turnouts came in the decades after the Second World War.. Perhaps the visceral connection between sacrifice and the democratic process was more evident to voters…(and Veterans)…then, because it was literally paid for in blood…”. Right on ! There is no question that many of us, have slowed down, drowsed off and grown fat…OK, no need to be ashamed of our weight. But there is a great need to be deeply ashamed of not carrying our weight, when it comes down to our real responsibility to act as responsible citizens, in determining the continuing way of life for that very same country of ours for which we few fought so fiercely to keep our freedoms flourishing. “Our” war of yore may be long over, but there are still battles to be fought for our country within our country…..not with bullets, but with ballots ! Both as Veterans and as part of the total Canadian citizenry, we are faced with myriad problems which affect us today, and will affect our children and grandchildren tomorrow and the day(s) .following. Not only what will become of my vanishing vintage of Vets, but also, and equally if not more important, the current and future treatment of our “younger” brothers -in-arms, who fought just as hard and bled just as much, trying to keep the peace in perilous places like Somalia, Bosnia, Rwanda,Haiti, the Middle East and many others, plus “the pick of the litter” being Afghanistan. Enough said !! And that is by no means all that should concern us as Veterans. What about such things as the economy , higher taxes, cost of living increases, unemployment and so on down the very long line of important matters affecting not only you, but your family, your neighbours, your community and, for that matter, your/our whole darn country ? Or do you just not care anymore, and have become indifferent to what’s happening in and to the world outside your own little comfort zone ? “So what?”, you say….I’ll tell you ” what” ! We Canadians have a national election coming up this 19th of October, and while I will never presume to tell anyone whom to vote for, I do dare to demand that we all get off our bony butts to participate in our cherished democratic process. Help to elect the representative(s) whom, after due diligence, you decide will best act on your/our personal and collective behalf, as Veterans of all ages and all military operations. Check him/her out very carefully, satisfy yourself that your choice will not just talk the talk, but actually walk the walk, and is prepared to do so in your old service boots ! Your duty as a Canadian /Veteran is far from over. You fought for and preserved a democratic way of life; now is the time for you to benefit from your victory by voting for those candidates who will most truly and consistently recognize, respect and reinforce the rights of all true Veterans all across Canada. Voting is not simply a right or a privilege. I look upon voting as an obligation that we Veterans should/must fulfil at all costs, and I sometimes even consider the possible advantages of enforceable mandatory voting laws, such as now exist in some forward-looking countries. Whatever your view, let your views be known to the people who are even now submitting their resumes and applying to you and me for the pretty cushy yet highly critical job of performing as OUR public servants and doing OUR bidding for the forthcoming years. So do yourself, your family, your friends and your fellow-Vets a forever favour, by going out to VOTE, and getting out the VOTE !!!! And always remember to…. …LEAVE NO VET BEHIND ! 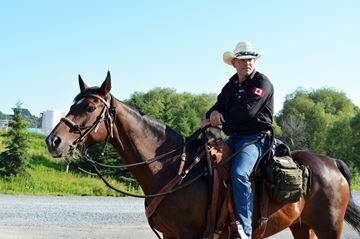 Former soldier, Paul Nichols, saddled up to bring attention to veterans’ issues across Canada. The 29th Lieutenant Governor of Canada, the Hon. 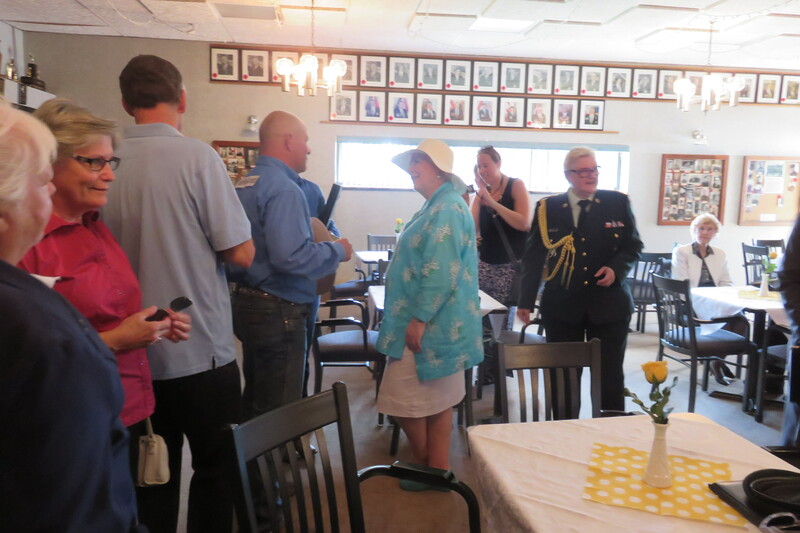 Elizabeth Dowdeswell, welcomed Canadian veteran Paul Nichols at the Aurora branch of the Royal Canadian Legion, today–Aug. 9, 2015–in this special National Peacekeeping Day event. Paul is making a cross-country ride on horseback to draw attention to the inadequate care of our veterans. The Hon. Elizabeth Dowesdell, Lieutenant Governor of Ontario, talks to veteran Paul Nichols about the stories he has gathered from other veterans across Canada and the initiatives she hopes to sponsor for Ontario’s veterans. ride to educate the public as well as to provide all veterans with an opportunity to share their experiences trying to re-adjust to home life. By helping everyone bridge the gap in recognizing the ever increasing physical and mental health needs of veterans–from inter-provincial governments to the federal government, to the public in general and to other veterans feeling unheard and unappreciated–this ride that began in Victoria, B.C., in April to reach the East Coast in November is recorded on the “Communities for Veterans” web site. 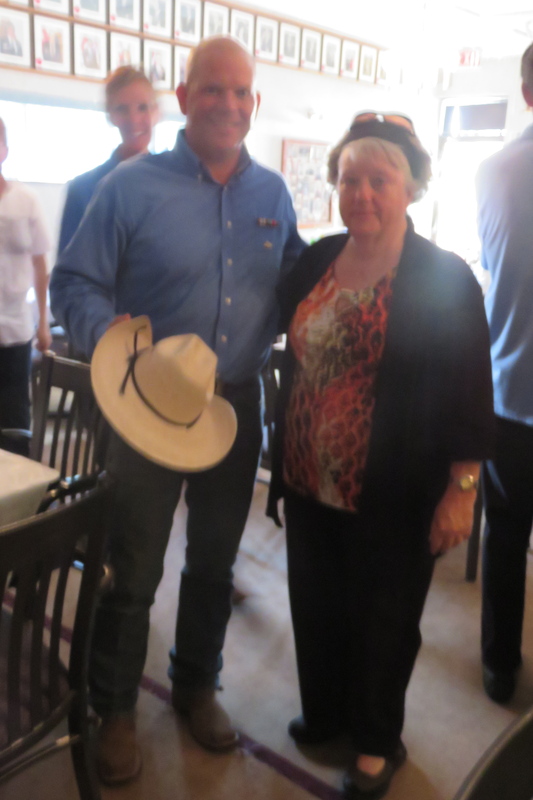 Bonnie Toews with Paul Nichols inside the Aurora Legion Hall. Paul’s wife, who is also riding across Canada on horseback with him, stands just behind him. The Aurora branch of the Royal Canadian Legion welcomed the riders on this National Peacekeeping Day to help them spread their message and to draw the public together to show them its thanks for their service to Canada. Ontario’s Hon. Lieutenant Governor thanked all veterans for their service in her personal recognition of Paul Nichols’ crusade to make sure no veteran is ever forgotten or unappreciated again. On Homecoming Vets we would also like to thank you, Paul and your family, for going the extra distance to bring public attention to what our service people endure on duty for Canada. To learn more about the cross-Canada ride or to donate funds toward helping existing veteran-support groups, visit communitiesforveterans.com, send an email to cyf-events@mmgrp.ca or call 250-668-3338. I received an email yesterday from a veteran advocate who continues to fight the Canadian government’s position on the adverse effects of the anti-malaria drug mefloquine or Lariam as a preventative treatment for the military since the early 1990s. I find the government’s response insulting to our intelligence and lacking all human compassion. I quote in part its position: “The Department of National Defence (DND) and the Canadian Armed Forces (CAF) take the health and well-being of CAF members very seriously. Malaria is a potentially life-threatening infectious disease to which our troops can beexposed in the performance of their duties during deployment or travel in theregions of the world where malaria is present. The use of medication to prevent malaria is a critical part of the protection we provide our troops. The current approach in the CAF to protect our personnel against malaria does include mefloquine as one of the medications that we recommend and use. This issue is not a high school debate where each point is seen as a reasonable hypothesis nor is it an acceptable justification. We are talking about the LIVES of human beings being so detrimentally affected they can no longer function, of human beings who suffer every day from the continuing adverse effects mefloqouine causes and whose symptoms, as we are learning, grow worse as they age. To ignore the agony of these FEW that we the people in the name of our government deny is not only irresponsible, it verges on inhumane criminal treatment. It is no different than a hit-and-run driver who leaves the scene of an accident. We, the government of the people, for the people and by the people, are responsible for ALL the people we represent, not just SOME of the people SOME of the time nor when it suits us. Yes, malaria is a dreadful disease. Yes, more troops were lost in WWII to malaria than to actual combat fatalities. Yes, we have to protect ourselves against malaria when we travel to places where it prevails. Yes, it is good the Canadian military now give service members a choice in which anti-malarial they take after being informed of all the possibilities. BUT, this does not justify our government’s ignoring those casualties of the mefloquine drug over the years since it was first issued as a mandatory prophylaxis for those serving in our military. These victims need recognition, and they need help NOW. Our government needs to return to the scene of the crime and take responsibility for the injury it has caused the FEW for an extended number of years. Thank you Dr. Nevin for your persistent investigation into the effects of this drug on our military and innocent travellers. I was appalled to learn that Tanzania recommends mefloquine (Lariam) to tourists and downplays the possible severe side effects. Shame on Canada! Shame on Health Canada! Shame on the Canadian Armed Forces! Shame on our government’s refusal to recognize the mounting evidence of the “military’s suicide pill” — the anti-malaria drug mefloquine or Lariam, as it is also called. I am reposting recent reports that confirm how dangerous this drug is. Since we now have boots on the ground in Iraq, their lives and sanity are at risk as this drug is still issued as Canada’s preferred anti-malaria preventive treatment. There are other much safer and effective drugs, but they do cost more, particularly malarone used in both the treatment and prevention of malaria. 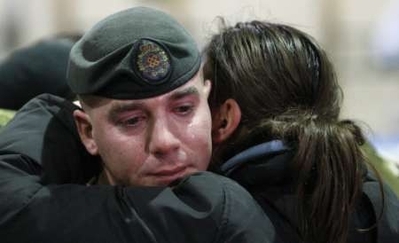 The callousness of our government in the treatment of our finest and best trained soldiers staggers the mind and heart of every caring Canadian. It’s time to make this government accountable for its deliberate and criminal neglect in safeguarding those who volunteer to sacrifice their lives for our country. Our military’s willingness to be sacrificed is not an invitation for the Canadian government to exploit them or to treat them as expendable fodder. Why is mefloquine so dangerous? 3. “Mefloquine, a neurotoxic drug that can cause permanent brain injury, is contributing to our unprecedented epidemic of mental illness and suicide” among our military and veterans. Mefloquine (brand names: Lariam, Mephaquin or Mefliam) is an orally administered medication used in the prevention and treatment of malaria. Rare but serious neuropsychiatric problems have been associated with its use. Mefloquine was developed in the 1970s at the United States Department of Defense’s Walter Reed Army Institute of Research as a synthetic analogue of quinine. The brand name drug, Lariam, is manufactured by the Swiss company Hoffmann–La Roche. In August 2009, Roche stopped marketing Lariam in the United States. Generic mefloquine from other manufacturers is still widely available. It is on the World Health Organization’s List of Essential Medicines, a list of the most important medication needed in a basic health system. There is widespread belief that mefloquine can have negative psychological effects on the user and that troops returning from deployments where mefloquine was used may be misdiagnosed as having PTSD rather than suffering from the effects of mefloquine. The three following articles from the US, Canada and the UK explore and document various aspects of the use of mefloquine. Dr. Remington Nevin and the CBC’s Nancy Wood when she interviewed the former U.S. Army medical officer two years ago. cause lasting injury to the brainstem and emotional centers in the limbic system. As a result of its toxic effects, the drug is quickly becoming the “Agent Orange” of this generation, linked to a growing list of lasting neurological and psychiatric problems including suicide. Yet, these observations only confirm what should have been apparent all along. Mental illness, including depression, anxiety, and psychosis, are known to be strong risk factors for suicide. And since 1989, when mefloquine was first marketed in the U.S., the product label has clearly warned that the drug could cause symptoms of mental illness, including anxiety and depression, and hallucinations and other psychotic manifestations. Since mefloquine increases the risk of mental illness, and mental illness increases the risk of suicide, it follows logically that mefloquine increases the risk of suicide. 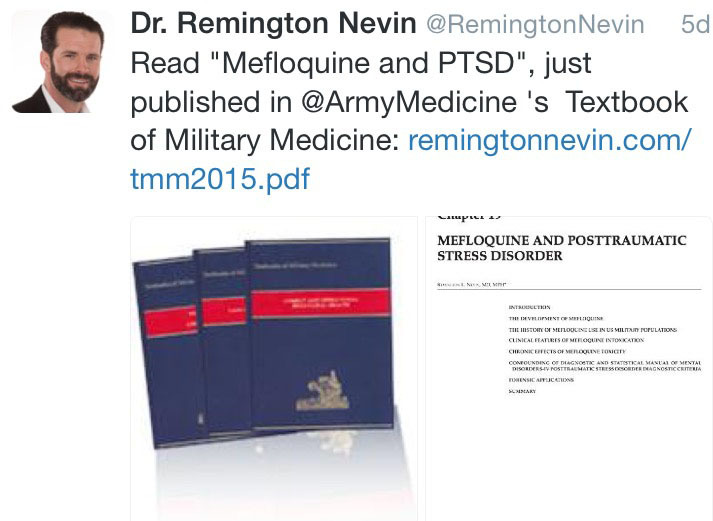 We now recognize that mefloquine can even occasionally cause a true dissociative psychosis. In a grip of such a terrifying psychosis, victims have jumped from buildings, or shot or stabbed themselves in grisly ways reminiscent of scenes from M. Night Shyamalan’s film, The Happening. Those who have survived mefloquine’s psychotic effects describe experiencing morbid fascination with death, eerie dreamlike out-of-body states, and often uncontrollable compulsions and impulsivity towards acts of violence and self-harm. dizziness or memory problems, insomnia, vivid nightmares, irritability and other changes in mood and personality caused by the drug have struggled to make sense of their lasting symptoms. Some of these veterans have even been diagnosed with PTSD or TBI. But, some veterans, including those without traumatic exposures or who had never suffered a concussion, in whom these lasting symptoms couldn’t be easily explained, were accused of malingering or of having a “personality disorder”. In some cases, these troops were discharged without medical benefits and left to fend for themselves. It should not be surprising to learn that some of these mefloquine veterans, mentally injured, confused, and cast out by the military that unwittingly poisoned them, would later take their own lives in desperation. In 2004, the military was strongly encouraged to conduct careful studies to evaluate the role of mefloquine in suicide, but these studies were never done. In light of the FDA’s black box warning, fulfilling this long overdue recommendation should now be a priority. Yet, conducting such studies shouldn’t be necessary for today’s military leadership to acknowledge what follows logically from today’s science: Mefloquine, a neurotoxic drug that can cause permanent brain injury, is contributing to our unprecedented epidemic of mental illness and suicide. We must do more to reach out to veterans suffering in silence from the drug’s toxic effects, and ensure that those at risk of suicide understand how the drug has affected their mental health. As importantly, mefloquine veterans need to have affirmed by the military what they have suspected all along: that they are not crazy, and that it really is the drug that is the cause of their symptoms. We owe it this generation of veterans to recognize the neurological and psychiatric effects of mefloquine neurotoxicity alongside PTSD and TBI for what they are: the third signature injury of modern war. An anti-malarial drug that has been withdrawn from routine use by the U.S. military because of concerns about potentially dangerous side-effects continues to be prescribed to Canadian troops serving in malaria-prone regions. The drug, called mefloquine or Lariam, has been associated with psychiatric and physical side-effects that prompted the U.S. military to withdraw it from general use in 2009, but the Canadian Forces continue to prescribe it to soldiers. Risk of permanent effects cited U.S. army doctor Maj. Remington Nevin, who first gained experience with mefloquine during his deployment in Afghanistan in 2007, says that “there are a certain group of users in whom … these symptoms, the anxiety, the difficulty sleeping, the mood changes, these could be an indication, an early warning sign of a developing, more serious brain condition… a toxicity caused by rising levels of the drug. Berry says he quit taking the pills, without telling his superiors, and the side effects stopped. But, the military’s continuing use of mefloquine “is definitely deviating from the evolving standard of care, or the evolving standard of practices of Western militaries,” Nevin says. Thousands of British soldiers are being put at increased risk of psychosis and suicide because the Ministry of Defence refuses to stop using a controversial anti-malarial drug that has just been banned by the U.S. military, The Independent can reveal. with a string of suicides and murders – the U.S. military acted this month to ban its use among special forces. The decision came after it was linked to the massacre of 16 Afghan civilians by a U.S. soldier. Yet, British soldiers are still being given Lariam – a drug described as a modern-day “Agent Orange” by doctors because of its toxicity. Mefloquine is typically given to soldiers serving in sub-Saharan Africa, parts of Latin America and South-east Asia. Lt. Co. Croft estimates around 2,500 soldiers a year are given the drug. Lariam was developed by the U.S. Army in the 1970s, and approved by the U.S. Food and Drug Administration (FDA) in 1989. It became a popular drug for preventing and treating malaria, but recent years have seen it become superceded by newer antimalarial drugs, such as malarone. While most NHS doctors now recommend that civilians travelling overseas take alternatives to Lariam with fewer side-effects, British service personnel are given little choice about whether to take the drug. This is despite the U.S. military banning Lariam on safety grounds. The decision comes after an order in July from the FDA to force manufacturers to give the drug a black box label, its strongest warning. The FDA warned that some neurological and psychiatric side effects can last for months or years after people stop taking the drug. Staff Sergeant Robert Bales, the U.S. soldier who killed 16 Afghan civilians in March 2012, had taken Lariam while serving in Iraq. While ordinary soldiers are routinely given the drug, the MoD ordered that it should not be given to air crew or divers, given the particular risks of such posts. In its latest guidance for commanders, dated 2013, it cites “significant risk of side effects, which could degrade concentration and co-ordination,” and that any such specialist personnel who take it will be unfit for duty for three months. The controversial anti-malarial drug Lariam has been linked to a series of military suicides, murders and incidents of self-harm during the past 20 years. * In 2000, Lance Corporal Kristian Shelmerdine, the Parachute Regiment, shot himself in the arm while serving in Sierra Leone. He blamed the accident on the drug, claiming to have had bad dreams and woken up to find himself shot, but was found guilty of ‘negligent discharge.’ Two years later, four U.S. soldiers based at Fort Bragg, North Carolina (three of whom had recently returned from Afghanistan, where troops were prescribed Lariam) killed their wives. Two of the soldiers killed themselves. Learn how our Homecoming Vets are bonding and advocating to bring about more public disclosure of their real needs. Learn about our federal government's ultimate betrayal of our Armed Forces' trust and loyalty. You can receive Homecoming Vets posts directly to your inbox and share what's happening. Saying it had to modernize to reflect the new, unwrinkled face of the Canadian veteran, the federal government revamped legislation governing benefits for retiring and disabled soldiers in 2006. The New Veterans Charter, introduced by the Liberals under Paul Martin, backed by all parties and passed by the newly elected Harper Conservatives, was designed to meet the complex needs of veterans from the war in Afghanistan. Young soldiers didn't want to sit at home, waiting for a cheque in the mail, reasoned the government. They wanted work in civilian society and to live fulfilled lives. The Veterans Charter would provide that by offering improved counselling, vocational training and one-on-one case management. Veterans at the time warned that the new charter would drastically cut disability payments at a time when thousands were coming home wounded from Afghanistan. The changes, critics said, were all about saving the government millions at the expense of soldiers permanently disabled in the line of duty. As it turned out, these CRITICS WERE CORRECT. •4,181 Number of veterans receiving disability benefits whose disabilities are directly related to their service in the Afghanistan mission, as of Dec. 31, 2011. Bonnie Toews is a former business journalist reporting for logistics and private security magazines and now a novelist, speaks out for the victims of genocide and war, from the peacekeepers and coalition forces trying to save suppressed peoples to the children and innocent civilians caught in the crossfire of opposing powers, ideologies and cultures. Current writing "Trilogy in Treason." Member of Military Writers Society of America, American Authors Association and ACFW.